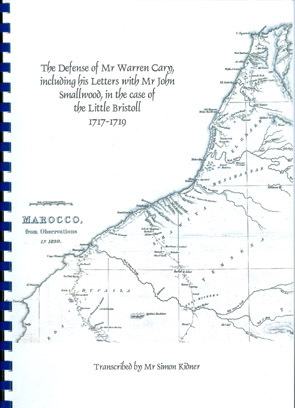 The Little Bristoll set out from Bristol in November 1717, on the first leg of a planned triangular voyage: first, to the west coast of Africa to trade cloth and metalware for a cargo of slaves that, on the second leg, would be taken across the Atlantic to the plantations of Virginia, Maryland or the West Indies; the ship would then return laden with sugar and mahogany. That was the plan, but they never reached Africa. The ship was captured by the fearsome 'Sally Rovers' - Barbary Pirates based at Saleh on the Atlantic coast of Morroco. Captain John Normanton, master of the Little Bristoll, and his men were taken to Mekinez, site of the Emperor of Morocco's Palace, and imprisoned. The British Consul visited the Emperor, who graciously offered to turn the men over to his care, but this offer was thrown back in the Emperor's face. He wasn't interested in the men, the Consul explained, just the cargo and the ship. Stung by this insult, the Emperor enslaved the crew, and John Normanton died in captivity many years later. Meanwhile, back in the markets of Bristol and London, and two months after the Little Bristoll had set out, rumours began to circulate of the capture of a Bristol Galley. Warren Cary, one of the owners, hastily arranged additional insurance on the Little Bristoll and her cargo. When it was confirmed that the galley in question was indeed the Little Bristoll, the Underwriters fearing they had been cheated, refused to pay for the loss. The owners sued, and during the Court session of Easter 1719, James Bunyard and his fellow Underwriters issued a Bill of Complaint in the High Court of Chancery to counter sue against Warren Cary and his business colleagues alleging that the policy had been taken out fraudulently and with prior knowledge of the Little Bristoll's capture.